Ready to march onward through tough outdoor jobs? Lace up these Chippewa® Lace-to-Toe Logger Boots and get to it. The self-cleaning Vibram Logger outsole stomps all over tree fragments, loose gravel, and whatever other unstable terrain you encounter. For added safety on the job, the Steel Toe is ASTM-rated. For your comfort, the Texon insole cushions as well as supports. And of course, this these Logger Boots come with Chip-A-Tex breathable waterproof protection from rainy days and sloppy worksites. Tough jobs are no challenge for these Logger Boots…order yours today! 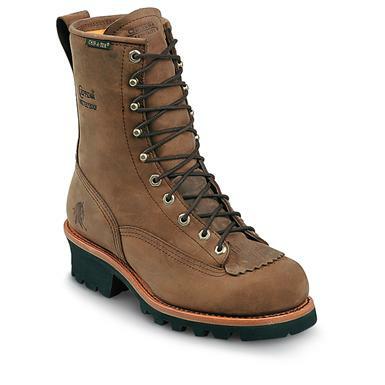 Chippewa Mens Paladin Bay Apache Lace-to-Toe Waterproof Steel Toe Logger Boots is rated 5.0 out of 5 by 1. Rated 5 out of 5 by retired from Great Price! This boot is a hard boot that can withstand all types of waterproof and steel type hazards and can be washed in yhe washing machine if needs be. I don't recommend it.